Peter Leue (pronounced Loya) (b. 1946) has worked in wood and mixed media for five decades. 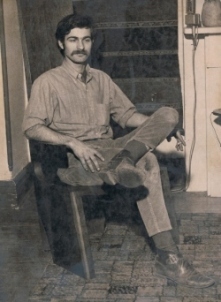 He studied with Wendell Castle and Bill Keyser at the School for American Crafts at the Rochester Institute of Technology, and received his Bachelor of Fine Arts in 1968. An award-winning artist and craftsman, Peter concentrates on interactive and functional sculpture. .
After spending 12 years teaching, Peter began full-time woodworking in 1981, and for over two decades, specialized in architectural reproduction woodworking, for which he won a Preservation Merit Award from the Historic Albany Foundation in 1984. In 2000, he began the restoration of an 1850's Gothic Revival cottage, which resulted in another Preservation Merit Award in 2004. In 2007, he sold his large shop and designed and built a 900-square-foot studio next to his home. Though his work has ranged from architectural woodworking to fine studio furniture and cabinetry to whimsical sculptural pieces, Peter now concentrates on creating sculpture, functional sculpture, commissioned studio furniture and interactive works of art. He has designed and built many one-of-a-kind pieces, including a 2011 series of tables titled "Sabotage," based upon their unique sabots or wooden shoes. "Trefoil on Tiptoe" was chosen for The Fence Select Show, at The Arts Center of the Capital District, 2011. Several pieces of his work were selected for a group show in October 2011 by the Marion Royael Gallery. In February, 2012, Peter completed a group show at the Desotorow Gallery, Savannah, GA. In addition, his Goliath's Tailor (aka Maxiature X 12: Spool) was chosen as a winner in the sculpture category in the ArtSlant.com First 2012 Showcase competition, and his Divide and Conquer (aka Maxiature X 8: Compass) was chosen as a Second 2012 Showcase competition. Screw Up was chosen as a 4th round winner. Deus ex Machina was chosen as a 5th Round Winner. Peter's work has been shown internationally, in Taipei, Taiwan, and in the eastern US. In 2013, Peter's Loving (Albany) Cup was selected as the Nancy Hyatt Liddle Best in Show at the Historic Albany Foundation's "Built" Show. It was also in a group show at the Annmarie Garden, called Finding Our Place: The Geography of Art, between October 2015 and January 2016. Peter's work was shown in two one-man shows in Taipei, Taiwan at the Guang Xiang Gallery and the Danish Warehouse. A third, group show, was held in Taipei City Hall, and was sponsored by the Taipei Puppet Museum in early 2014. Two of Peter's altered pianos were featured in the Downtown Albany Business Improvement District's public art project, part of the international "Play Me, I'm Yours" exhibitions in June-July 2014. Two of Peter's current series of 12 wooden, posable figures called Posers recently traveled 2200 miles through the US South, visiting and posing in five southern cities. A story about the Posers travels in the Albany Times Union can be found here. In May-June 2015, Peter's Peace Crane, made from his Homage to AC Gilbert giant Erector Set pieces, is on display at the Brooklyn Waterfront Artists Coalition in their "Wide Open 6" Show in Red Hook, Brooklyn, while Cupid, Love Drone (another Poser) flew in the "Heroes and Villains" show at the Annmarie Garden and Arts Center in Dowell, MD from June-August 2015. Wooden Sentries was on display in Woodstock, IL, at the Old Courthouse Arts Center, at the 2015 Real People show. Member Show, Albany Center Gallery, Albany, NY. December 2015. Finding Our Place Group Show, Annemarie Gardens and Sculpture Park, Dowell, MD, October 2015-January 2016. Brave New Dances, eba Dance Theatre. Dance performance using Musical Chairs sculpture as a basis for newly choreographed dance works. Albany, NY. November 2014. Play Me, I'm Yours, an international art exhibition using adorned and altered pianos in Albany, NY, June-July 2014. Two-man show sponsored by the Taipei Puppetry Museum in City Hall, Taipei, Taiwan, Jan-March 2014. Upstate Artists, a group show of work by artists from the Albany-Saratoga region, curated by David Miller, Professor Emeritus at Skidmore College, at the Laffer Gallery, Schuylerville, NY. November 29, 2013-January 5, 2014. Rhapsody in Wood: two one-man shows at the GuanXiang Gallery and the Danish Warehouse Gallery in Taipei, Taiwan. October-November 2013. Crest Hardware Art Show 2013. A hardware-themed group show in Williamsburg, Brooklyn. Jun-August 2013. Showing the Crest Annunciator 2013, the latest in the Homage to A.C. Gilbert series. Working/Drawing, a group show featuring artists' working drawings and photos of completed works. Fulton Street Gallery, Albany, NY. Jan. 25 through March 9, 2013. Upstate Artists, a group show of work by artists from the Albany-Saratoga region curated by Elizabeth Drubben, at the Laffer Gallery, Schuylerville, NY. December 9, 2012 through January 20, 2013. Fourscore Gateway, commissioned by the Center for Economic Growth and Proctors Theatre for the CEG annual meeting, October 24, 2012. Piece remained in the arcade at Proctors Theatre, through November 2012. One-day installation, Crossroads of Imagination, at the opening reception for the MoHu Fest, a 10-day "holiday for the arts" in the Mohawk-Hudson River Region of New York State. This four-county celebration of the arts was held in an unused hangar at the Albany International Airport, a space large enough to accommodate this massive 40' X 40' X 22' installation. October 2012. "Marquis" pieces in group show, Crest Hardware Art Show, Williamsburg, Brooklyn, July–August 2012. Intertwined group show, at the Desotorow Gallery, Savannah, GA, February 2012. Heavy, group show organized by Marketplace Gallery, at the Historic Albany Foundation-owned St. Joseph's Church, July 2010. Nancy Hyatt Liddle Award for Best In Show at BUILT, Historic Albany Foundation's annual art show and sale, November 2013. Judged by Robert Gullie and Susan Stuart. Rounds 1,2, 4 and 5 Showcase Winner in the Artslant.com Artslant Prize 2012 Showcase. One of Top Fifty Winners of the Third Ward, Brooklyn Fall Open Call, an international artists' competition. January 2012. First Place in show: 16th Northeast Fine Crafts Exhibit curated by Ursala Ilse-Neuman, curator at the American Crafts Museum, NYC. Schenectady Museum, Schenectady, NY, 1998. YNN News, "Giant erector set on display at local art gallery," first aired August 9, 2012.